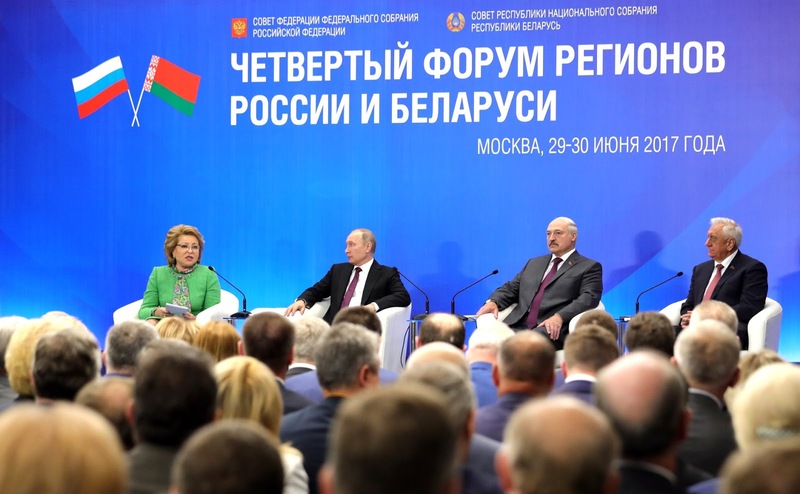 Fourth Forum of Russian and Belarusian Regions. 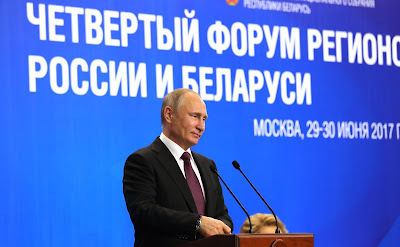 Putin.BLOG Foreign Policy Regions Fourth Forum of Russian and Belarusian Regions. Attending the plenary session were Speaker of the Federal Assembly Federation Council Valentina Matviyenko, Speaker of the Council of the Republic of the National Assembly of Belarus Mikhail Myasnikovich, St Petersburg Governor Georgy Poltavchenko, and Chairman of the Vitebsk Regional Executive Committee Nikolai Sherstnyov. 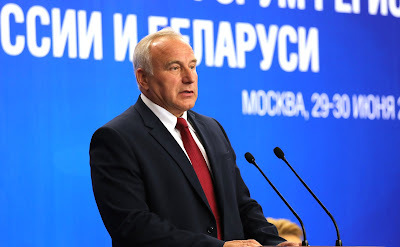 The forum, which is being held on June 29–30, has been sponsored by the Federation Council of the Federal Assembly of Russia and the Council of the Republic of the National Assembly of Belarus. 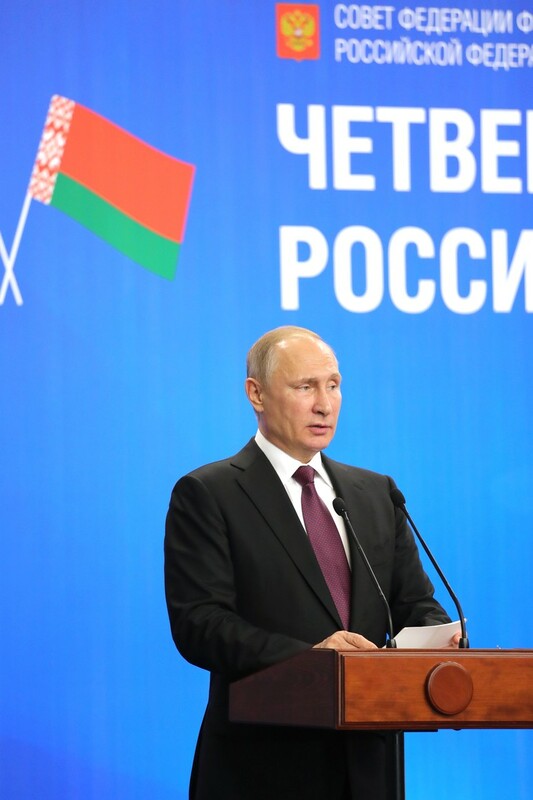 The forum is held to promote direct ties between Russia and Belarus, including ties between their legislative and executive authorities and business communities, and to draft recommendations for improving the legal framework for boosting the two countries’ economic development. 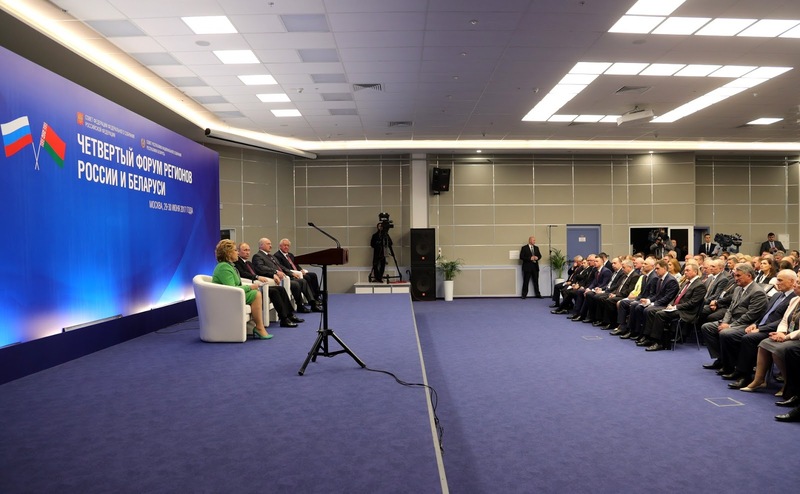 The first Forum was held in Minsk in 2014, the second – in Sochi in 2015 and the third Forum – in Minsk in 2016. Later today, Vladimir Putin and Alexander Lukashenko will chair a meeting of the Supreme State Council of the Union State of Russia and Belarus. 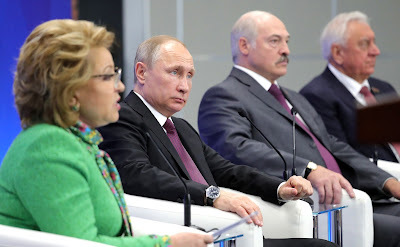 Speaker of the Federal Assembly Federation Council Valentina Matviyenko, Vladimir Putin and President of Belarus Alexander Lukashenko, Speaker of the Council of the Republic of the National Assembly of Belarus Mikhail Myasnikovich at the fourth Forum of Russian and Belarusian Regions. 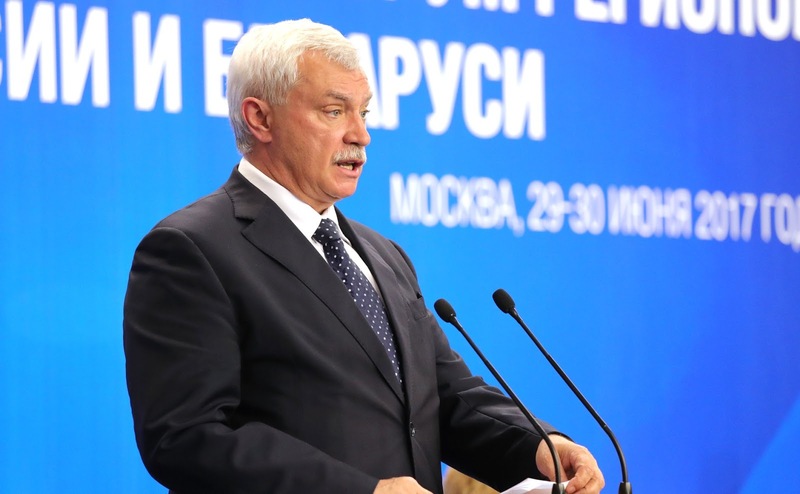 Speeches at the fourth Forum of Russian and Belarusian Regions. Speech at the fourth Forum of Russian and Belarusian Regions. I am happy to welcome you to the fourth Forum of Russian and Belarusian Regions. Our countries are strategic partners in the true sense of this word, and they are very close allies. Working on the solid foundation of friendship and good neighborliness, we are promoting our ties in all spheres, including the crucial sphere of interregional relations. Our example has a positive influence on our work with our colleagues within the CIS, the Eurasian Economic Union and the CSTO. The overwhelming majority of Russian regions are working closely with their friends in Belarus, particularly on the basis of bilateral cooperation agreements, and are implementing projects both on the region-to-region level, and as part of cooperation between chambers of commerce and industry, research centers and individual enterprises, which the governors just told us about in their reports. I believe that working together we have managed to build an effective structure of cooperation, which creates a reliable basis for increasing business activity and the flow of capital into our respective economies. In 2016, Russian investment in Belarus reached $4 billion, with direct investment, accounting for the bulk of this amount at $3.5 billion. Russian businesses are investing in Belarusian transport and the manufacturing industry. In turn, Belarus has invested over $600 million in Russian agriculture, retail trade, and the pharmaceutical industry. Notably, Moscow, Pskov, Smolensk, Sverdlovsk and Tyumen regions, Bashkortostan, Tatarstan, as well as Moscow and St Petersburg have established particularly strong cooperation ties with their Belarusian partners. 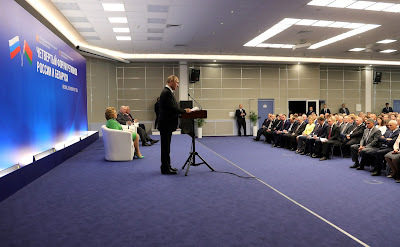 Vladimir at the Fourth Forum of Russian and Belarusian Regions. The interaction between Belarus and the Russian Far East is gaining momentum. The joint creation of a modern agricultural town in Sakhalin Region is a case in point. We expect the number of such mutually beneficial projects to grow, specifically with the use of the opportunities that open up for businesses in new Russian regions. Colleagues, this forum focuses on expanding cooperation between the regions of Russia and Belarus in the spheres of high technology, innovations and information society. We have just discussed this here. Today, a new economic pattern is taking shape right before our eyes. It is based on active introduction of digital technologies, innovative materials, robotisation, and green energy. The long-term competitiveness of our countries and their positions in the global division of labor will depend on how we meet these technological challenges. I will go as far as to say that our future depends on our ability to achieve this goal. Therefore, it is imperative to step up our efforts to create joint high-tech industrial clusters and engineering centers, to build flexible cooperative chains to manufacture research-intensive products that meet the highest international standards. In a word, we should combine our production, research and personnel potential in order to achieve powerful practical results. We certainly have everything we need to make this happen. Only recently, the Union State Council of Ministers adopted a resolution on the key areas of activity for building a single research and technology space within the Union State. Joint scientific technical programs like Novopol and Kompomat have served as effective tools for coordinating efforts by researchers and engineers in our two countries. They provided a technology platform for creating cutting-edge polymer and composite materials. Innovation in the medical sector is another important area of joint activity. A program to develop advanced restorative treatment methods and technology using stem cells has been completed, and the program to treat children with congenital spine deformities will follow. A developed transport infrastructure should be an integral part of the future economy. We intend to keep improving high-speed passenger traffic across the Union State and developing pan-European transport corridors through the territory of our countries. The construction of the Belarusian Nuclear Power Plant in Ostrovets has great prospects. I am confident that this city will evolve into a major research center and will win international recognition in the near future, just like Obninsk in Russia, where the first nuclear power plant in the world was built. I have said it on numerous occasions, and I would like to repeat that our countries have immense resources in terms of human capital, as well as intellectual and educational potential. The leading companies and universities of Russia and Belarus have the capability to develop state-of-the-art technology and software products that could compete on the global market. Let me emphasize that Russia is ready to engage in close cooperation with our Belarusian partners to ensure steady and lasting economic growth. We stand ready to coordinate our industrial and technology-related policies, develop infrastructure, and help create a favorable business environment. The Forum of Russian and Belarusian Regions also contributes to these efforts. We hope that the meaningful debates at this forum, the agreements signed within its framework and the joint programs that will be approved here will make a substantial contribution to strengthening the Union State and stepping up integration across the vast Eurasian space in general. Speaker of the Federal Assembly Federation Council Valentina Matviyenko, Vladimir Putin and President of Belarus Alexander Lukashenko at the fourth Forum of Russian and Belarusian Regions. This year we celebrate the 20th anniversary of the Union of Belarus and Russia. This date symbolizes our choice of a primary development trajectory – the shared aspiration to integrate and cooperate extensively in the social, economic and cultural spheres, among others. Much has been done in the past two decades. At any rate, no other state has done as much in the field of integration. There was much talk but not that much action. So, we have done a good job in this respect. Production cooperation and the on-going Union Program show that we have achieved success by merging our material and intellectual capabilities. As a result, the economies of both Belarus and Russia are deriving considerable benefits. Inter-regional cooperation is playing a large role in this respect. In the period under review, forums of Belarusian and Russian regions have become an open venue for confidential discussions of pressing issues. I would like to thank the heads of the two upper chambers of our parliaments, and not for the sake of flattery. This is not only their child. They are the drivers of this positive movement toward greater integration. I appreciate their cooperation in this vein. They are anxious to see the continuous development of our events in the forum framework. They are seeking out and suggesting new forms of cooperation. This is a good contribution to the construction of the Union State. These annual events allow representatives of local governments and higher levels of government to maintain continuous contacts. I was told today’s forum is attended by representatives of about 80 Russian regions and all regions of Belarus. Of course, it is important that we are showcasing our achievements at the forum and even holding thematic sessions. It is not easy to single out one area of our cooperation. 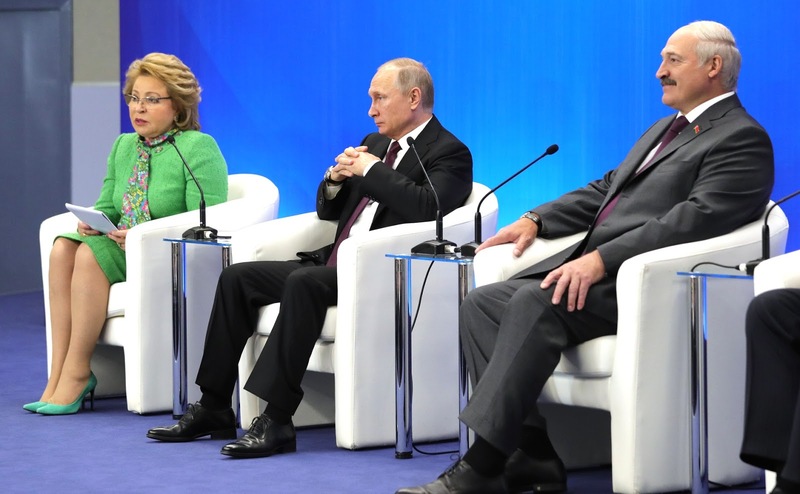 Ms. Matviyenko and Mr. Myasnikovich suggested (Mr. Putin mentioned this) a very complicated area that affects the future of not only our states but also our people. The question is whether we will be able to survive in the long term. If we lag behind in the area that we are now discussing, we are doomed to stay there and nothing will save us, neither our potential nor hydrocarbons. You see the direction in which the world is developing and the pace of it. This is why we have chosen such a narrow but very promising area, and we have much to discuss. Over 700 specialists and top managers are present at this forum. This is worth a lot. At present, we have 70 agreements at the level of the Belarusian Government and administrations of Russian regions. Each of them is accompanied by a specific action program for three to four years ahead. At previous forums, we discussed issues of agriculture, industry and social policy. Today, as I have already said, we are discussing a new technological mode. Cooperation in high technologies and information society is particularly topical. In Belarus, we are paying very serious attention to this issue. One of the main priorities of the Belarusian economy is the development of industry – a sector that accounts for a quarter of our GDP. Importantly, high-tech and science-intensive industries make up over one third of the GDP structure. 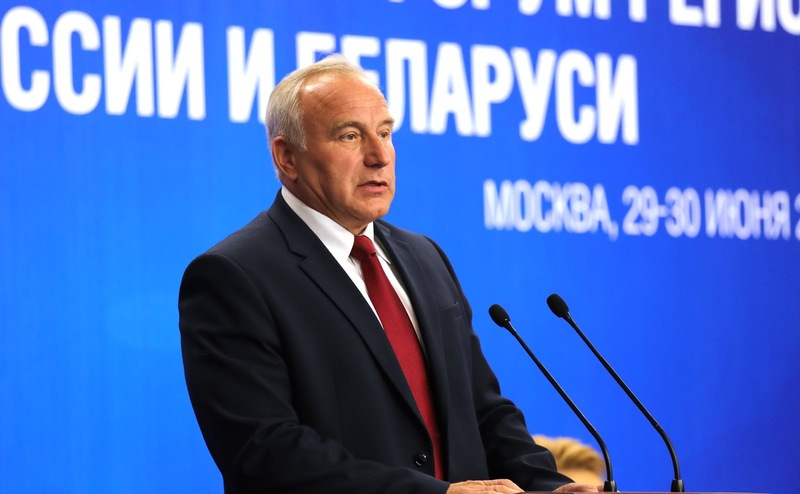 It is enough to note that at the pan-Belarusian people’s assembly three years ago we set an ambitious goal for the innovative development of Belarus. And we were right on target, as we can see now. However, when we studied world experience, we could not help shedding a tear – we were lagging behind. We are lagging behind. Advanced countries are ahead of us in terms of development, innovative forms of development and so on. We are lagging behind and we must catch up to shape our destiny, as the President of Russia has just said here. The state program for innovative development until 2020 was endorsed in January. It includes 75 projects in developing new production lines. Its goal is to ensure greater quality and competitiveness of the national economy with resources concentrated in high-tech sectors. I think Russia’s prestigious schools and centers of science will always find attractive areas for development and cooperation with Belarusian colleagues, as the governors mentioned today. I am convinced that it will be easier for our two countries, which have unique capabilities and experience of cooperation, to confidently step into the future together in order to compete in the world market at a fitting level. Information is the key resource at the present stage of economic development. To paraphrase a maxim, ‘he, who possesses information, possesses the world’ – this describes the current reality in global politics, the global economy, and all other spheres of human life. Cooperation between our countries in the sphere of information technology is becoming one of the pillars of our strategic partnership. The following areas can be singled out. Firstly, developing human potential. Secondly, improving the efficiency of public administration in the economy and social sphere. Thirdly, organizing a digital economy. Fourthly, ensuring the security of the citizens and the state. Notably, our contacts in the sphere of information technology could develop more dynamically on the platforms that have already proved their efficiency, such as the well-known high-tech park in Minsk. More than 1 billion people in 193 countries use mobile applications developed by companies that are residents at this park. Over 90 percent of the software produced in the park is exported to Russia, the CIS, and Western Europe. The United States has a special interest in it. We have set ourselves the ambitious goal of turning Belarus into an IT country. We will shortly adopt the legal framework for such a development path in Belarus. Importantly, Mr Putin, these legal documents were drafted by Belarusians and Russians, and submitted for consideration to the highest Belarusian authorities. I am confident that this will be our joint project and will make a meaningful contribution to the development of the most modern area of our society and economy. Special legal regulations have been created to provide comfortable business conditions for the China-Belarus industrial park called Great Stone, which is part of the Great Silk Road project recently discussed in Beijing. The Russian President and I shared our opinions and made serious proposals during this meeting. I would like to take this opportunity to invite Russians engaged in modern technology research across various fields to work in this park. This park offers unprecedented working conditions. Importantly, the products to be made by park residents must be cutting-edge in quality and conform to tomorrow’s specifications, because if we create today's products, we will not be able to sell them tomorrow. After this Silk Road meeting, we saw many new residents arrive at the park. We reached agreement with President Xi Jinping that it will be not only Chinese companies. Everyone is welcome. We have many companies from Western Europe. I believe we will have this park completely built in 18 months at most. We had a slow start, but have picked up the pace since then. I would very much like Russian companies, even better, joint Belarusian-Russian companies, to work there. We have things to create there. Extensive cooperation in producing high-tech science-intensive products is will pave the way to overcoming global challenges in the future. The main requirement to this produce is its speedy introduction into mass production in Belarus and Russia. This is particularly important because of growing competition in the world market. The elaboration and implementation of coordinated economic policies by Russia and Belarus will go a long way to encouraging such production, facilitating the growth of its export potential and promoting effective import substitution. As the President said on numerous occasions, it was a blessing in disguise. All those sanctions and the like prompted you and us to take action. After all, our cooperation is powerful and we constitute a uniform economic complex. It did not collapse after the Soviet Union’s disintegration. We simply added to what existed – something in Russia and something in Belarus, and something together – and this complex is functioning. As for import substitution, we had to approach this three times, as far as I remember. We faced this issue much earlier than you did. We have been under sanctions for a very long time. And this blessing in disguise again provided a powerful impetus for import substitution in Russia, and we found ourselves in tune with the times. We adapted to this pace and today it is easier for us to work with Russia on import substitution. We must promote this trend by establishing Belarusian-Russian joint ventures. Having sufficient research personnel remains a key factor. We have not only preserved this capacity, we enhance it every year. Almost 26,000 people and over 500 organizations are involved in R&D in Belarus today. In 2016, the number of postgraduates exceeded 5,000; more than 500 people were involved in doctoral studies; 50 people received their doctoral degrees and 500 received their PhDs. I have to single out cooperation in the education of young scientists. I am proposing to the scientific community of our countries that it step up work in this area. Young researchers should have all the opportunities for close contacts with their colleagues. It is necessary to enhance cooperation between scientific schools in the most promising areas. Cooperation between Belarusian State University and Moscow State University is a good example. By tradition, Belarusian and Russian academies of sciences are the main drivers of joint research. Seven joint Belarusian-Russian centers and laboratories have been established and are successfully working in the National Academy of Sciences of Belarus. Another three are still in the process of formation – with the Kurchatov Institute in Moscow, the Institute of Gene Biology at the Russian Academy of Sciences and Kuzbass State Technical University. The Joint Centre of Science and Innovations of the Academy of Sciences of Belarus and the Siberian Branch of the Russian Academy of Sciences is an example of successful cooperation. They have been cooperating successfully for a long time. It includes the research center of oil and wood chemical technology, the joint laboratory of innovative bioengineering technology and the Russian-Belarusian laboratory of systemic biology. They are working successfully. I am convinced that the programs that we are financing from the budget of the Union State should fully meet high scientific criteria. We have already carried out over 40 union research programs in various industries. This allowed our two countries to merge their intellectual, technical, industrial and financial capabilities and enhance national security. Needless to say, in our cooperation with Russian regions we are laying emphasis on supplementing our opportunities in joint implementation of federal and regional projects. You know, I meet every governor who visits Belarus, even two or three times. This is standard practice for me in my work and, generally, my life. 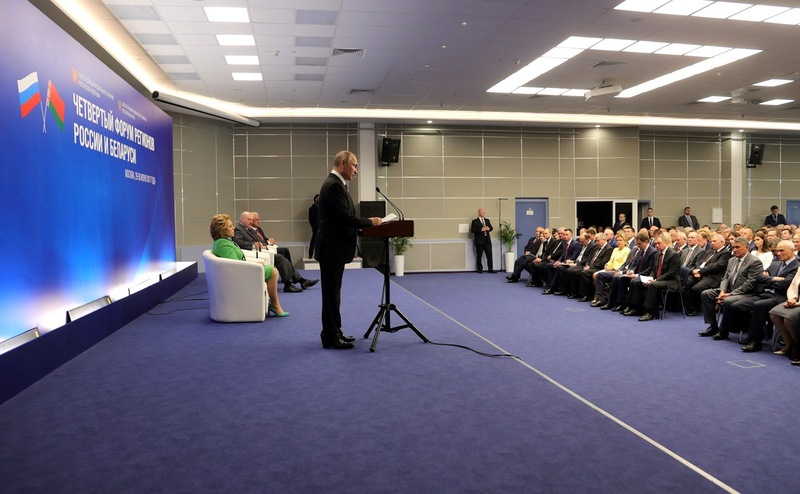 I am pleased that the Russian President reminded us of our joint project on Sakhalin Island. It is an interesting project. I have had a friendly relationship with Oleg Kozhemyako [Governor of Sakhalin Region] for a long time now. He used to work in Amur Region, we actively cooperated and supported each other with research, and our ministers accomplished a lot there. Then, he left for Sakhalin. Later, he came to see me and said, “Mr Lukashenko, we have things to do on Sakhalin.” My idea of Sakhalin was a place with rocky mountains, volcanoes, and such. Unfortunately, I have not been there. He says, ‘No, the land is good there, and so on. But we need science, specialists, and the like.’ Our Minister of Agriculture has been almost part timing there as Minister of Agriculture for three years now. 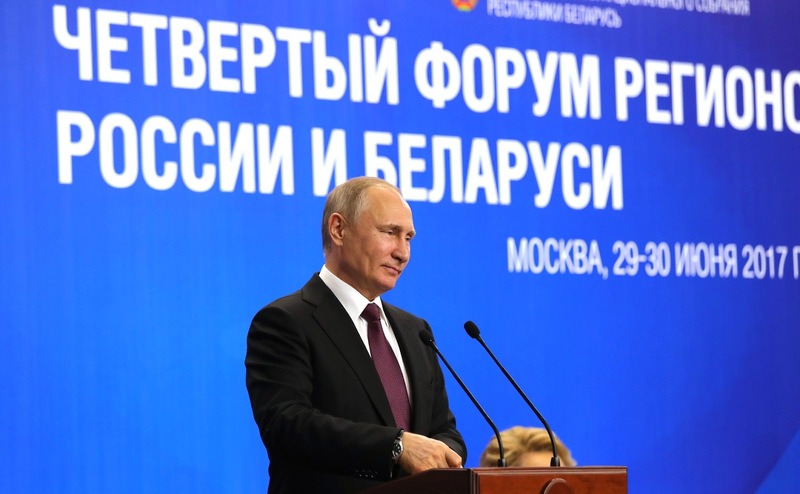 The Russian President learned that we have, in fact, created not just an agricultural town, but a top-of-the-line agricultural enterprise and an agricultural industry that could be replicated all over Sakhalin. Mr. Kozhemyako and I agreed that it was a matter of our honor to make sure that Sakhalin never bought another item of agricultural produce, but cultivated and grew its own. We brought our specialists, equipment, and seeds there. Not so long ago, we sent high-yield livestock there as well in order to develop our production there. This is happening on Sakhalin. What can we say about neighboring regions? Similarly, Russians are working in Belarus today. We, at the top, may not know everything, but you are as busy – in the positive sense of the word – as ants, if you consider it all. I am very grateful to you for this. You are doing a great job, and we need to keep up this pace as we create our common space and show everyone that sanctions and pressure are not a problem to us, and we will overcome everything. Thanks to the brotherly relations between our peoples, we have enormous opportunities and resources for further building up mutually beneficial cooperation between Belarus and Russia across all spheres. As I mentioned earlier, the regions play an extremely important role in this. To emphasize, regardless of geographical distance, all Russian regions are close to us, Belarusians. We hope that Belarusians will be treated everywhere in Russia exactly as the Vitebsk Governor said. So far, we have had no problems in this regard, we do not frighten each other, and we go to each other’s countries as brothers, as kin. This is happening between people, not just our in speeches from high lecterns, whether we talk about social guarantees, citizens' rights, and supplies of Belarusian equipment, agricultural produce, scientific developments, or services. This approach will allow us to not only reach the modern level of technological development, but, most importantly, to preserve our unity and confidence in the future. Chairman of the Vitebsk Regional Executive Committee Nikolai Sherstnyov at the fourth Forum of Russian and Belarusian Regions. St. Petersburg Governor Georgy Poltavchenko at the fourth Forum of Russian and Belarusian Regions. 0 Comment to "Fourth Forum of Russian and Belarusian Regions."